We plate gold to Military or ASTM Specification only. We do not do decorative jewelry plating. Gold plating is the process of electrolytically depositing a layer of gold onto a part. Plated gold deposits can range in color from yellow to orange and be bright or dull (matte) in appearance. Engineers and manufacturers often use gold plating because of its exceptional resistance to corrosion. 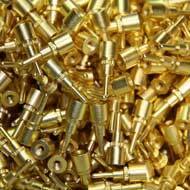 Gold plating also has low contact and electrical resistance making it ideal for electronic applications. Many electronic parts, such as connectors or circuit board components, are gold plated to provide maximum corrosion resistance while maintaining excellent conductivity and solderability. MIL-G-45204 and ASTM B 488 are the prime gold plating specifications. They define three types of gold deposits produced by electroplating. Types I, II, and III refer to purity while grades A,B,C,D refer to Knoop hardness. The most common alloying elements in Types I and II are nickel and cobalt. In many gold-plating applications where the substrate is made of copper or silver, a barrier layer of nickel is applied between the substrate and the gold to prevent the copper or silver ions from diffusing into the gold layer. Type III gold (99.9% gold is usually referred to as "pure") is used in the semiconductor industry when parts need to be wire bonded during fabrication. The Type 1 and Type II gold deposits are harder and are alloyed with either cobalt or nickel as deposited. These alloys have a much higher hardness and are more appropriate for contacts and connectors. Hi-Tech Plating will work with you to ensure that the right type of gold plating is selected for your application. Hi-Tech Plating provides gold plating in accordance with MIL-G-45204 and ASTM B 488 for Types I, II, and III. Gold plated jewelry can have deposits as low as 10 karat purity (out of 24). Gold plated colors such as "green or white" gold can be produced. Gold was probably the first metal worked by man. It can be found in a pure state and can be hammered and worked easily into decorative jewelry pieces. In nature, gold is often found alloyed with silver and to a lesser degree with lead. Giving something the "acid test" arose from a method that was used to see if something was really made of gold. 24 karat gold skin treatments are offered by some spas. Real gold powders or flakes are used and miraculous results claimed. The only true result is the reduction of one's bank account. Gold is inert and therefore cannot accomplish anything beneficial.